The beautiful Herefordshire countryside has so much to offer, and here at Caroline Bulmer Properties we want to ensure you make the most of your stay. With such a large amount of things to see and do it’s hard to know how to prioritise it all, so we thought we would give you some recommendations on sights that you wouldn’t want to miss on your holiday. 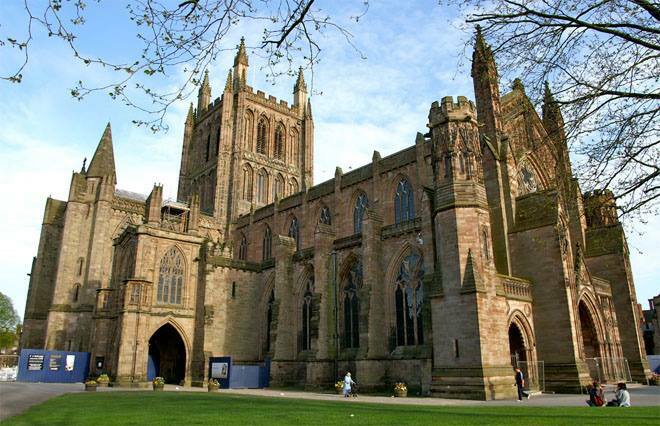 Herefordshire is renowned for the Cathedral, the Mappa Mundi and The Chained Library, sights steeped in culture and English heritage, here’s why they are not to be missed. Considered a must see tourist attraction in Herefordshire, the Cathedral towers majestically over the city. The sheer size of the Cathedral and the attention to detail in the architecture will have you standing in awe before you have even entered. Home to a host of treasures, the Cathedral offers magnificent painted chapels and burial shrines to be admired. The stained glass windows are imposing as you walk through towards the altar, and very few visitors leave without a lasting impression of their beauty and skill that created this amazing place. We highly recommend visiting the Cathedral whilst the choir are practising, or attend a regular service and take time out to reflect and listen to the angelic singing in the inspiring surroundings. The Mappa Mundi is unique in English heritage and records how scholars of the 13th century interpreted and perceived the world in both geological and spiritual terms. It shows Jerusalem at the centre of the world, surrounded by other geographical regions, as well as illustrating biblical events and creatures of the natural world. To this day it is considered one of the most important and celebrated medieval maps, and one that many tourists seek to discover when they visit Herefordshire. The Chained Library is the largest of its kind in existence and with all the original rods and locks intact, it’s a special sight for any history buffs or medieval enthusiasts. It’s the home of many important books and manuscripts which were chained due to their high importance and value, this was a method that was considered the best security system from the middle ages. The system allows books to be read on the desk whilst remaining chained to the bookcase. The library holds a number of copies of the original Magna Carta, which is considered to be the foundation of English Law. The Cathedral always has plenty of knowledgeable staff on hand who are happy to give a more detailed insight into the importance of the Mappa Mundi and The Chained Library. Make sure you take a visit, and share their enthusiasm about the great history of Herefordshire with them!